I am making a presentation to a group of retired UND faculty this morning on the topic of oil and the North Dakota economy. It is more of a free-flowing discussion than a chalk-and-talk format so I will add interesting comments later after I hear them. 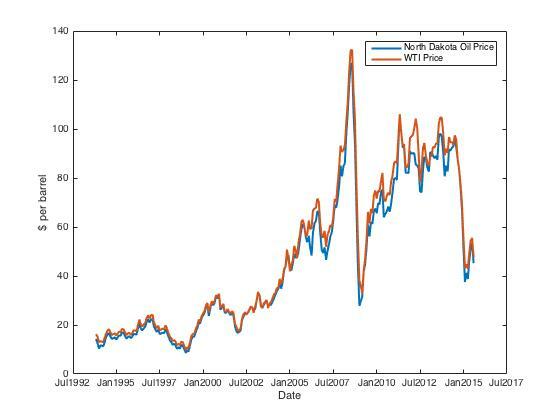 Oil is clearly a transformative event in the North Dakota economy. We can have an argument about the relative importance of different sectors all we want, but the emergence of the energy economy was an enormous factor in the early 2000s. 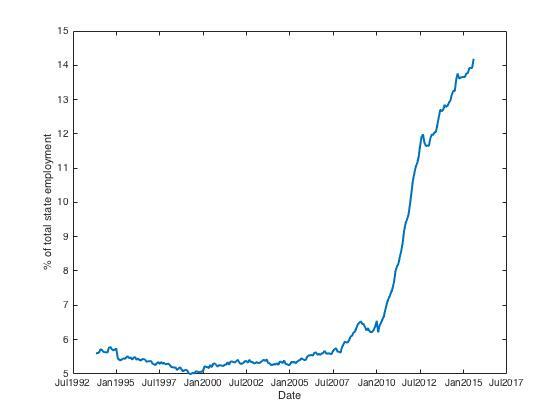 Looking at the graph below I make the following observation: we are at the end of the first boom-bust cycle in the oil industry in North Dakota. That’s all this is. We have not run out of oil and it is not, at least yet, an industry regulated out of existence. The share of total North Dakota employment made up from the core Bakken counties (Dunn, McKenzie, Mountrail, Williams) continues to increase, thought at a slightly slower rate. It remains well into the double-digit territory when it used to be below 6% of employment. So job losses across the state are more spread out than we might have considered previously. Lastly, consider the graph below. 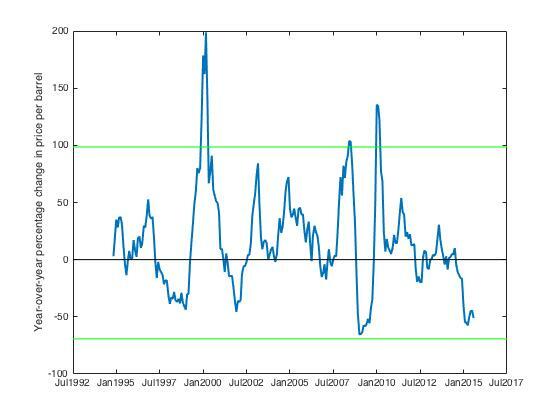 This just confirms that we are in the first sustained downturn in oil prices since, well, since the year 2000. The other big drop was due to the financial crisis, not internal dynamics of the oil industry. It will be interesting to see where this goes in about six to eight months when we will be coming out of the North Dakota winter, normally a slower time for development in the industry.